The more we’ve seen how CalPERS operates, the more it’s clear that the California agency has become a governance train wreck. The latest example is of CalPERS’ general counsel, Matt Jacobs, repeatedly making verifiably false statements to the board over its plan to curb the time speakers have to give comments in public board meetings. What makes this incident disturbing is that it shows that Jacobs routinely misleads the board so that staff gets what it wants. In any well run organization, a culture of casual lying is dangerous because it fosters bad decision-making and facilitates cover ups. Yet this behavior is on display regularly from CalPERS’ general counsel, both one of its most senior offices and aside from the CEO, the one most responsible for acting as a check on misconduct and improprieties. As we’ve stated: It is destructive to have an employee, and worse, the head of a critical control function, lie casually and flagrantly to his bosses and not be called out or otherwise sanctioned for it. A big reason that Jacobs can get away with this sort of thing is that the overwhelming majority of board members at CalPERS are derelict in the performance of their duties. They treat their seats as a sinecure rather than an oversight role that among other things requires them to monitor staff conduct. Yet despite a scandal that resulted in former CEO Fred Buenrostro going to prison over a pay-to-play scandal that including him taking paper bags filled with cash, CalPERS’ response has been for the board to cede even more authority to staff, even though staff misconduct that was the source of that very crisis. For instance, CalPERS’ board had four staff members as its direct reports, meaning among other things, it could fire them. The board voted to reduce its oversight by reducing its direct reports to one, the CEO. One of the consequences of less staff accountability to the board is staff members who see fit to give the board inaccurate and incomplete information in the interest of advancing the agendas of staff. Matt Jacobs is thus a case study of the bad effect of the CalPERS’ board’s lax attitude and choice to throw away tools for exerting influence, since the general counsel historically reported to the board as well as the CEO. In recent years, CalPERS imposed a three minute limit on speakers in public comments in board meetings However, CalPERS never took the steps to do so legally, as we discussed last month after we were cut off during a statement to CalPERS board. As we pointed out then, Jacobs lied to the board. Shortly after I told the board in August that it lacked the authority to impose time limits on statements from the public, Jacobs falsely told the board that a “draft regulation” was “already in the works” to be brought before the board next month. 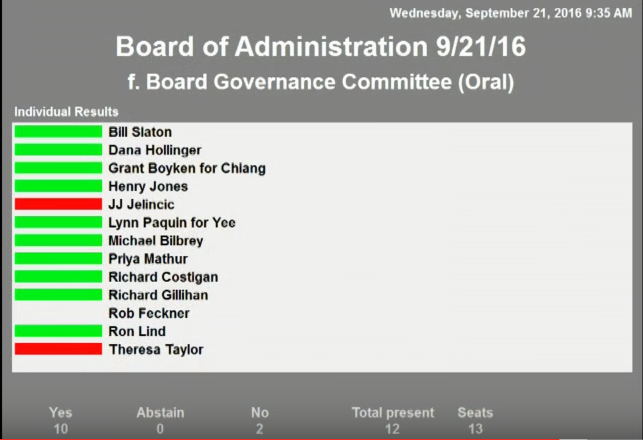 However, it was not in the board agenda for September, which was released the next day. If CalPERS wants to set time limits on public comments, the law is clear: it may do so via regulation, which is a formal process. Assertions about “policy” don’t satisfy this requirement. Bill Slaton, Chairman, Governance Committee: First, Mr. Flaherman and the fact that we don’t have a regulation, still, the limit is three minutes and there is a red, green and yellow light up here that you will be able to see. Michael Flaherman, Visiting Scholar, UC Berkeley: Good afternoon. I’m Michael Flaherman. I’m a visiting scholar at UC Berkeley. I was a member of this board from 1995 to 2003. Mr. Chairman, respectfully I would ask for you to waive the three minute limit. Slaton: Uh, we have…It’s eight minutes to 3:00, we have three speakers here, we have another meeting following this. Slaton: That’s part of your argument. I understand that. I tell you what, I’m going to do. We have three speakers and unless there’s serious objection I’m gonna allow four minutes each. Without objection that’s what we will do so you now have, we will reset the clock, you have four minutes. Flaherman: I’m sorry, to be so procedurally a stickler here. I would ask as a courtesy that you would have the minutes note my objection to the imposition of a limit. Slaton: We’re recording the meeting. Flaherman: Could the minutes note that? Flaherman: You won’t order the minutes to reflect that. Slaton: The minutes are gonna be as they’re spoken. Flarerman: No, that’s not true, that’s not how they are composed and you and I both know that. Look, look, here’s the issue, here’s the issue, which is that [background conversation] page two of the agenda item says that there is a three-minute policy and that in the past there was a two-minute policy. There is no three-minute policy. This board has never acted – and I’ve not talking about regulation but even just even as internal matter of policy the Board has never acted to impose any kind of policy. What happened was that in May of 2012, your staff started printing on the agendas that there was a three minute time limit. That just happened. Now I thought you guys were in charge. I thought you guys were in charge, but I hear Mr. Jacobs talking about this as a decision that we made and when he’s using the royal “we,” it’s not really clear whether he is talking about we the staff or you. Does anybody here want to raise their hands and say they were involved in the decision to impose a three minute time limit? [Board President Robert Feckner raises his hand]. Flaherman: OK. So was made by the board president and you. OK, well, that’s very helpful. But again there was no action of the Board. Right? So yet this is held out as a policy. Now even further still we have a statement from your legal staff that previously there was a two-minute time limit. Now I have the circular letters going back to 2004. I have one from every year and I would like to have this conveyed to the chair….could I have this conveyed to the chair? I’ll walk over. So you will see that on these circular letters that there was never any note of any of any kind before May of 2012. So the statement that you guys are being generous by giving a three-minute time limit because you used to me much tougher and enforce a two-minute time limit that simply not true. It’s not true. So here’s the bottom line. We all read the New York Times on Sunday and you guys are getting raked across the coals, a very unfair article written by Mary Walsh, a woman who has been generous over a period of decades. I knew her 1997 or something, right, in her coverage of this pension system and she’s not your friend anymore. And who appears in the article? Bill Sharpe, a man who I thought was your friend. He was your consultant for decades and he is ripping you over the coals. You guys need friends and you’re losing them day by day. The system is dying day by day because the people who are your friends are not standing up for them. Slaton: Please complete your thought because your time has expired. Flaherman: So really that was how the system operated for decades and for decades there was no time limit, people that were your trusted friends came and gave your thoughts and you have the authority to do whatever you want to people who really caused trouble and I would urge you to reject this entire idea. Thank you. Jacobs has given no consideration to the fact that many of the issues that CalPERS deals with are complex, and an adequate presentation may take more than three minutes. That was the case when I attempted to explain to the board in the private equity workshop last fall how a presentation on private equity returns gamed the numbers so as to make private equity appear far less risky that it was. I could tell from the glazed looks in most audience members’ eyes that they were not able to absorb the information. Tt needed to be unpacked further, but that would have taken more than the allotted time. This limit can therefore have the effect of depriving the board of crucial information useful or even necessary to execute its fiduciary duty. So much the notion enshrined in Bagley-Keene that, as Karl Olson put it, “that government bodies serve the public and not vice versa.” Here you see that three important state officials, Treasurer John Chiang, Controller Betty Yee, and Richard Gillihan, who is governor Jerry Brown’s cabinet secretary, all voted in favor of less public input and a less well informed board. Only Theresa Taylor joined JJ Jelincic in seeking to have the board use the latitude it had before staff sought to gag public commentors, when it’s a certainty that critics, not cheerleaders, would benefit from more time. In other words, upon receiving Flaherman’s missive, board members should have asked why Jacobs why he had not acted or at least informed them as to why he thought it was reasonable to punt. Yet the board, in typical form, failed to do its job, leading to my protest in August and Flaherman’s remarks above. CalPERS is still under the shadow of its 2009 pay-to-play scandal, which severely diminished it as an institution. It is now under fierce scrutiny, both for its serious underfunding and its refusal to lower its return assumptions, despite the fact that we are now eight years into a “new normal” of flagging growth and central banks around the world pushing interest rates lower and lower. CalPERS can’t afford even a mid-sized scandal now, given its hostile environment. The last thing it can afford is a “make it up as you go along” general counsel like Matt Jacobs. The Act expressly prohibits the use of direct communication, personal intermediaries, or technological devices that are employed by a majority of the members of the state body to develop a collective concurrence as to action to be taken on an item by the members of the state body outside of an open meeting. (§ 11122.5(b).) Typically, a serial meeting is a series of communications, each of which involves less than a quorum of the legislative body, but which taken as a whole involves a majority of the body’s members. For example, a chain of communications involving contact from member A to member B who then communicates with member C would constitute a serial meeting in the case of a five-person body. Similarly, when a person acts as the hub of a wheel (member A) and communicates individually with the various spokes (members B and C), a serial meeting has occurred. In addition, a serial meeting occurs when intermediaries for board members have a meeting to discuss issues. For example, when a representative of member A meets with representatives of members B and C to discuss an agenda item, the members have conducted a serial meeting through their representatives acting as intermediaries. This entry was posted in Banana republic, Guest Post, Investment management, Legal, Politics, Regulations and regulators on September 29, 2016 by Yves Smith. Thanks for exposing the nitty-gritty detail. The lack of fiduciary duty displayed by CalPERS’ Board and key staff is appalling. What can CalPERS beneficiaries and CA taxpayers do to get rid of the captured Board? What to do when some of the Board members get their position due to their other office (e.g., CA State Treasurer Chiang)? Could emergency legislation make it possible to act to restore integrity? Unfortunately, voraciously ambitious California A-G Kamala Harris has dropped enforcement of Bagley-Keene in order to make nice with the nomenklatura, and Jacobs knows this. Mr. Flaherman would have to fund extensive litigation in which Feckner and company will be willing to squander tens of thousands of the pension’s members and beneficiaries dollars defending. Chiang is running for Governor in 2018, and made news yesterday. Curious that he finds his principles when it is politically convenient. I commented here about that, on another NC thread. It’s just for one year. Just a PR move–but deceptive, given Chiang’s flouting of fiduciary responsibility in how he’s acted in relation to this issue and to his handling of an amendment that was supposed to improve transparency but actually did no such thing–and neither nor his representative showed up or spoke against the changes that made it useless. This guy would be a disaster as Governor. It would be better to pull names out of a hat than elect some one who is skilfully duplicitous via their PR machine access. Limiting speakers to speak. This is going on all across the country. In my small town over 10 years ago they limited speakers to 3 minutes at Village Board Meetings. But that wasn’t good enough. Now they limit the number of speakers to 3 on each side of an issue for 3 minutes each. Demokracy? There’s no possible good reason for CalPERS to make itself less accessible to public scrutiny. None. The discussion about what would be minuted was disturbing. I’ve learned from experience that minute-taking can be a powerful position. It can be highly strategic–and thus political and open to abuse, depending on who is doing it and depending on what a group’s most powerful members want to be sculpted or concealed–all while being technically accurate, depending how one defines it. in continuing play by a powerful director who may or may not be unknown. Please understand that an attorney can only have one client. It is not anyone on the board but whoever sent or “chose” him. In any meeting where one thinks the attorney “playing” the Citizens ask, who is his client? It is not the citizens, not the whole of the board but must be one individual. That individual should be the head of the board or group. In a group composed of elected political officials the client should give directions to the attorney in public except in the case of law suits and it should be available after the suite is settled to the Citizens. our Government in order to obtain the results his client wants. It is the writing of script, assigning of actors parts and run-through rehearsal of drama to be presented to audience as unscripted and spontaneous at advertised time of performance. What is occurring is not only illegal but a tearing apart of The Citizens’ Compact that forms our agreement to giving up of some of our Natural and Inalienable Rights to come together to form “a more perfect union” in Government. Yves – I’ll add my appreciation for the great work you have done on CalPERS. It is so inspiring that I regret that I have been unable to make time to look into the operations of the Retirement Systems of Alabama, our public pension program. I have a number of clients who are current or future beneficiaries and I would like to find out how well they are being served by RSA. So far, we haven’t had much in the way of public scandals, but who knows what may lurk beneath the surface. As someone who has been subjected to the board’s pompous, pulled out of their..thin air three minute rule, I would like to express my gratitude to you, Yves. Thank you.